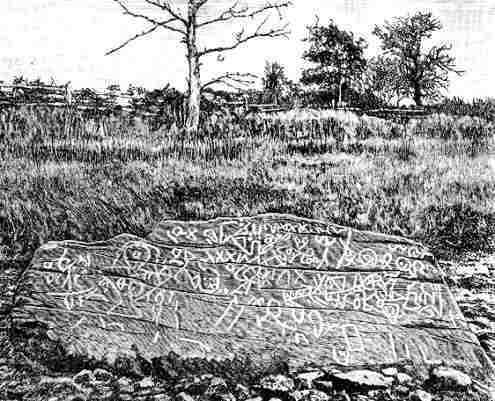 The famous Writing with Pictures Inscription conveys a record of an ancient battle between two Indian tribes which are carved in symbols on a large 40 ton stone which was found in the riverbed of the Taunton River at Berkley, Massachusetts. 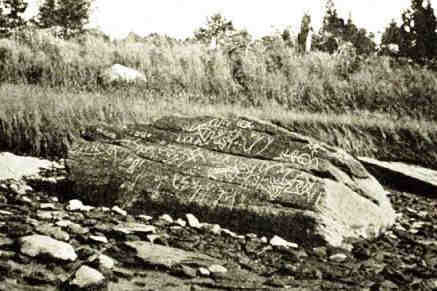 Writing with Pictures is noted for its Petroglyphs which are ancient carved designs and symbols. Writing with Pictures is estimated to be between 10,000 and 13,000 years old. Because of its age the origins of the rock can be authenticated and this had led to controversy and a series of theories regarding its origin. 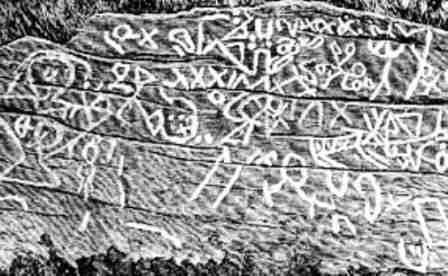 In 1680, the English colonist Reverend John Danforth, made a drawing of the Petroglyphs inscribed on Writing with Pictures. In 1732, the Royal Society of London requested and received Danforth’s drawing of Writing with Pictures. The Danforth drawing was later presented to the British Museum where it is preserved today. The following photograph was taken of Writing with Pictures in the riverbed of Taunton River at Berkley, Massachusetts.